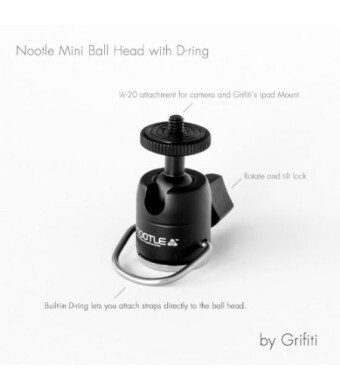 BRAND NEW GRIFITI NOOTLE D-RING MINI BALL HEAD! These are great for Nootle iPad Mounts, Smartphone mounts, and cameras! This is the same Mini Ball Head we use on our all Nootle iPad Stands and many customers asked us to just sell these stand-alone. Easily handles lightweight cameras and video cameras. Top mount thread is 1/4-20 thread and base is 3/8th-20 thread but we include a 3/8 to 1/4 reducer with the unit. 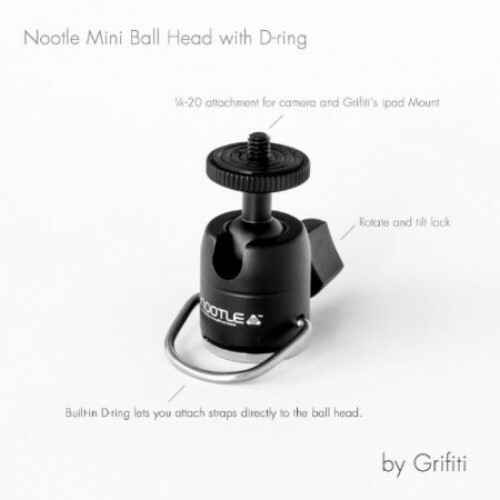 We developed this Grifiti Nootle D-ring Mini Ball Head for use with a strap so you can clip the D-Ring to a strap and carry it easily. It works great with our Nootle iPad, iPhone, and Smartphone mounts to allow you to shoot with your tripod or Nootle iPad Stands, but so many customers have been asking to purchase it directly we've recently added it to our product line. You'll find this versatile little ball head great to use with iPad mounts, iPhone holders, small digital cameras and video cameras. It's just the right size to handle a reasonable load but compact enough to easily store in a small pocket. We ship it with a 3/8-1/4 reducer on the base so it should fit just about any tripod or stand. We hope you'll come to love this little treasure as much as we do!